Many people are suffering the effects of flooding caused by heavy rainfall since mid-July. The most severely hit area is Bor County, where the White Nile has burst its banks, and where 19,000 families are in urgent need of relief supplies. Other areas include northern Bahr el Ghazal, Lakes and Upper Nile. An urgent priority for OLS is now to move in quantities of shelter items, as most people have no protection at all from the rains. Sanitation is also a major priority, as the risks of outbreaks of water-borne diseases have greatly increased. 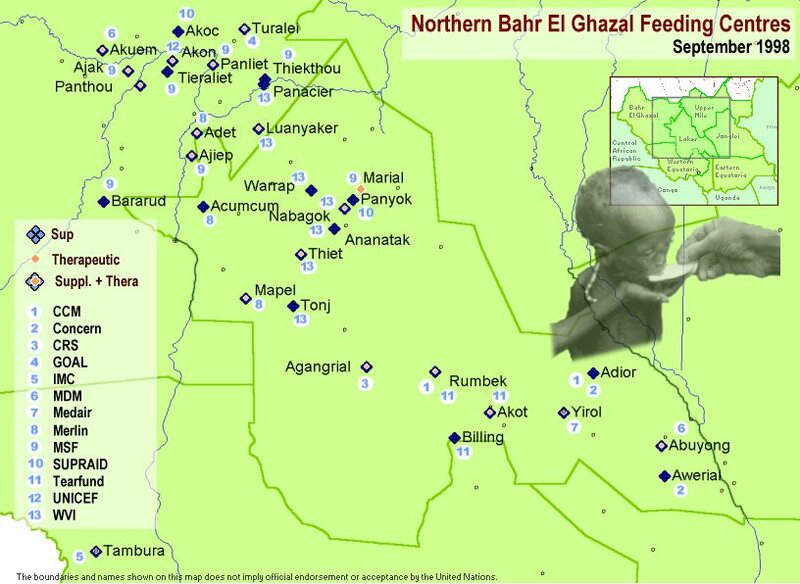 Several areas of Bahr el Ghazal, particularly the Lakes region, are seeing an improvement in the humanitarian situation. The impact of the massive relief effort is being felt, while the hunger gap is drawing to a close and people are beginning to harvest early crops such as groundnuts. The situation in Ajiep continues to improve. People are being encouraged to move away from Ajiep back to their home areas, through the opening of new feeding centres and food distribution points. The SRRA has assigned a senior and experienced officer to Ajiep. WFP has placed a permanent team of food monitors on the ground, while UNICEF has appointed the first of its new Resident Project Officers to Ajiep. While the situation in the Lakes is showing signs of improvement and conditions in Ajiep are relatively better, areas such as northern Bahr el Ghazal, Western Upper Nile and Bor County will continue to require significant attention until a secure and stable environment is guaranteed and a good harvest is collected in October 1999. The joint OLS/SRRA Task Force was established following concerns that some of the neediest people were not receiving any or enough food in Bahr el Ghazal. Members of the team were from OLS management, UNICEF, WFP, OXFAM, SCF-UK and SRRA. The Task Force found that the humanitarian intervention was constrained by a complicated set of interrelated social, anthropological, economic, military and humanitarian factors. The Task Force, which was operating under a very tight time frame, did not set out to quantify the amount of food that does not reach the neediest people, but rather to identify trends and patterns. The mission determined that many groups of the neediest people are being locked out of the distribution process, despite OLS' and SRRA's clear policies of targeting the most vulnerable. These groups include people without community representation, families with a child in a feeding centre and socially marginalised groups. The Task Force found that mechanisms established to distribute food and other relief items have been put under severe stress in the last three months. The targeting and distribution systems, which previously worked well, were found to be unable to cope with the increase in relief food supplied and the sheer levels of need. A practice of redistribution has emerged at the community level. After food arrives a t a location and distribution has been carried out according to WFP and SRRA procedures, the chiefs and local community subsequently regather the food and divide it according to their own priorities. The redistribution also involves giving a portion of food as tayeen (a contribution by the community to the authorities). The dilution of the food aid ration resulted in the most needy receiving a nutritionally inadequate ration. This partly explains why the nutritional condition of displaced persons continued to decline in many locations. A Working Group made up of SRRA, UNICEF. WFP, NGOs and donors have been established to prepare a plan for translating the recommendations of the Task Force into action. The plan is to be presented to the OLS consortium by the end of the month. In the meantime, some actions are already being implemented. These include the decentralistion of feeding centres, direct targeting of familes with a child in feeding centres and the deployment of more field staff by WFP. UNICEF and SRRA have deployed liaison and co-ordination staff to the field. WFP has clearance for 17 cargo aircraft. For the month of September clearance was given for all locations except Maridi, Mundri, Panyagor, Yomciir, Ikotos. *Security in Upper Nile has severely affected all OLS activities, including food deliveries. In Aweil West, UNICEF began three community leaders' dialogue workshops on 7th September, although no food for the training was not received until six days later. VSF-CH has requested UNVET to provide food for the Refresher Training's of Community Animal Health Workers scheduled for October. attending a Refresher Training in Abuyong. Assistant for a three months` training at AMREF Nairobi. VSF-B reported a suspected outbreak of anthrax in Tonj. Vaccines for control have been send by UNICEF. Some 206 separated children were identified in Luanyaker in Gogrial county by a team comprising SRRA, UNICEF and World Vision. Separation was found to have been caused by the death of parents, abandonment and insecurity. Particularly vulnerable is a group of 60-70 children who live around the main market, living off handouts from local traders. OLS agencies are discussing with the local community support for the children and their eventual reunification with family members. and facilities are being established in locations from which people originate. By assisting people to return to their home areas, the pressures caused by very large concentrations of people will be considerably reduced. considerably eased the pressure on the air bridge, and this new streamlined system is so far working extremely well. All agencies involved in the OLS feeding programme have agreed to implement standardised admissions criteria and are expected to achieve these standards by the end of September. This means that all children below 70% weight for height will be admitted into the therapeutic feeding programme, and children between 70% and 80% weight for height will be admitted to the supplementary feeding programme. A new Nutritional Assessment begins in Bahr el Ghazal this month. The assessment teams will revisit the 11 locations assessed in May and June and an additional 10 locations. Feeding centres are operating in 32 locations, providing food for over 40,000 children. Although the water and sanitation problems are far from being solved, there is a general impression that the most acute needs are now starting to be met. The priority was first on providing enough safe water for the feeding activities, health facilities and food distribution points where large numbers of people gather. A plan to address these problems for the remaining identified locations with rapid interventions using light portable drilling rigs has been developed and the work should be completed by mid-October. Sanitation activities have been kept to a minimum up to now, mainly because of the urgency of the water supply problem, but also partly because of lack of resources. The WES agencies are now focusing on sanitation as a matter of priority and developing a plan of action for sanitation interventions. The major constraints are still the weather conditions and the difficulties to get the cargo on site rapidly. MSF-B: in collaboration with MSF-H, 3 boreholes have been drilled in Ajiep and there is a plan for 3 more in the surroundings on sites where the former displaced population of central Ajiep are being encouraged to resettle by the local authorities. The drill will then go to Thiek Thou after this to drill 2 boreholes around the new therapeutic feeding centre. The sanitation in central Ajiep generated concern among the aid agencies on the ground. Stool analysis done by MSF-B showed the presence of Shigella Dysenteria. A sanitation program started on 3rd of September in a joint effort of MSF-B (coordination), SRRA (implementation) and Unicef WES ( intervention of Field Technician). MSF-H: their drilling programme in Panthou, Tieraliet and Ajak has been delayed due to weather conditions and flight constraints. The rig is now in Panthou to drill one borehole and will then move to the first accessible of the other locations. One water and sanitation engineer has arrived and will deal with the sanitation around the feeding centres. OXFAM: the SRRA rig operated by OXFAM has just finished a fourth and last borehole in Mapel. There is a need for two others for the agencies' compounds and the drop zone but a bigger rig is needed because of the hydrogeological conditions. The plan now is to send the private drilling contractor hired by Unicef and due to arrive in Loki in the course of next week. The SRRA rig will go to Panliet in support of the MSF-B feeding programme. The Eureka rig is in Akuem where MDM has a feeding centre. Three boreholes are planned and the rig will then go back to Malualkon for one more borehole for the PHCU. While on the site for drilling, OXFAM is conducting hygiene awareness sessions with the community and maintaining the existing handpumps. In Acumcum, the hand digging of a new well next to the MSF-B feeding centre is going on. A water engineer will be sent to Bararud to try and solve the problem of the newly drilled boreholes that are said to have dried up. SCF-UK: the hand-drilling programme in Ajiep goes on in spite of some technical problems. No fresh news from their other activities. ICRC: their PAT 401 drilling rig is due to fly to Marial Lou next week to start the drilling of 4 deep boreholes for the health facilities run by MSF-CH. It will then go to Thiet where the ICRC is opening a kitchen (wet feeding centre). In Tonj town, their Watsan engineer has rehabilitated 5 pumps and the situation is said to be stabilised. Unicef-WES: an assessment on sanitation was conducted in Ajiep and a Field Technician is on the ground to launch a response programme (see MSF-B above). An assessment on water availability in Agaigai was conducted with a Unicef nutritionist. There is no water point in Agaigai . There is a huge need in the area for improvement of the water availability and strengthening of the water teams. This will be addressed through the new water programme of GAA. One Field Technician spent one week in Acumcum to train the SRRA water team on well capping and protection as part of the OXFAM hand digging programme. The Task Force on Targeting and Vulnerability identified insufficient shelter materials (blankets, plastic sheeting etc) for the displaced as a problem OLS still needs to address. OLS is therefore holding a meeting on Monday September 22 in Lokichoggio to come up with a Relief and Shelter Items Master Plan of Operations for Bahr el Ghazal, targeting the displaced with relief items. The area of Bor County, where the White Nile has burst its banks, continues to suffer the effects of severe flooding. An estimated 19,000 families are affected, many of whom have fled their homes for drier land. According to MEDAIR, crops are rotting in the fields, and the displaced people are vulnerable to respiratory infections, fevers and malaria. An Emergency Response Team has been established in Lokichoggio to handle the crisis. Members include MSF-H, MEDAIR, ACROSS, IAS, UNICEF, WFP and SRRA. Delivering supplies is very difficult, as all but one airstrip, at Padak, are submerged. Medair and SRRA are constructing a new airstrip on higher ground, and some relief supplies have been air dropped. OLS is monitoring the humanitarian situation in the Torit area following the outbreak of fighting. The following incidents affected OLS personnel in Bahr el Ghazal, Western Upper Nile and Torit during the period 1-15 September. September 1: 10 minute gun b Wattle outside UN base camp in Loki. No casualties or damage to camp. September 6: OLS staff relocated from Mankien to Mapel. Evacuated to Loki on September 7th. September 15: four staff relocated from Lankien due to instability.